Andross, Emperor of The New York City Subway System! Street artist Posterchild—installer of Super Mario Bros. question blocks and Portal companion cubes in the real world—has let loose Star Fox nemesis Andross in New York City. Fear him, subway riders! 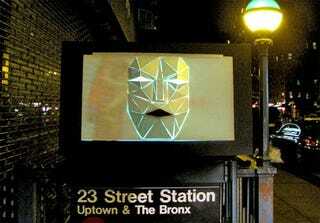 Super Smash Bros. Brawl fans may recognize this version of Andross as he appeared in the original Star Fox for the Super NES, but much of New York's commuting populace will be puzzled by the polygonal antagonist's cover up of their favorite glowing advertisements. You can enjoy photos of the Andross installation at Posterchild's Blade Diary.